Last Tuesday was Constitution Day – September 17. It marks the day that the Convention in Philadelphia in 1787 concluded and the final draft of Constitution was signed by the delegates who attended. It is fitting that this is the day we choose to honor the US Constitution. As we all probably know, the Convention was called in a somewhat devious and misleading manner. James Madison and others from Virginia called the Convention (after securing a promise that the most beloved man in America would serve as its president – George Washington) for the express purpose of AMENDING the Articles of Confederation and tweaking the Continental Congress (the government at the time) to make it more effective. The most glaring defect of the common government was its ability to raise the revenue it needed to carry out its functions. Luckily, the Virginia delegation couldn’t sell all of their plan to the other states and the Convention turned out to be a 4-month exercise in compromise and well-intentioned debate. In the end, on September 17th, we got a constitution that created a limited FEDERAL government. It was quite different in many respects from the government that the Virginians proposed. Luckily, the overwhelming number of delegates at the Convention that year did not believe in concentrating too much power in a common government; they believed that government is most responsive when it is closest to the People and so they remained steadfast that the bulk of government power must remain with the States. A government that is closest to the People can serve them best and can be “altered or abolished” by them when circumstances demand it. The delegates ranged in age from Jonathan Dayton (of NJ), aged 26, to Benjamin Franklin, aged 81, who was so infirm that he had to be carried to sessions in a chair. They brought with them the interests of their States and their people. They brought with them a wealth of knowledge and a keen eye on the prize they fought for in the American Revolution (which Patrick Henry would later describe as “that precious jewel – Liberty”). They brought with them their understanding of what a common government should do to serve them and also to serve a common good for all States. Not one State intended to surrender its sovereignty or its influence. Not one state intended to surrender its individual identity for a “national” identity. In the close of the Convention, only 39 delegates would feel compelled to sign the Constitution. Many refused to sign because there was no Bill of Rights. More than half of the Virginia delegation wouldn’t sign, including Mr. Randolph himself and George Mason (who wrote Virginia’s Bill of Rights). Elbridge Gerry, of Massachusetts was another powerhouse that refused to sign it. A Bill of Rights, they argued, was an absolute necessity to limit any government. The particular opposition by George Mason is most compelling. While Elbridge Gerry was, by most accounts, cantankerous, irritable, and most disagreeable to many things and Randolph was likely sulking since his Plan was rejected in good part and believing that the States would ultimately reject a new constitution anyway, it was Mason who refused to sign based on pure principle. George Mason didn’t trust a large republican government… not without a Bill of Rights, that’s for certain. He believed certain stipulations were necessary to protect the liberties of the People from the reaches of government. James Madison, on the other hand, argued against a Bill of Rights. It was his position that such stipulations weren’t necessary due to the nature of the Constitution. He argued that the Constitution specifically enumerated the powers that were delegated to the federal government. That is, the document explained what the government COULD do and not what it COULD NOT do. 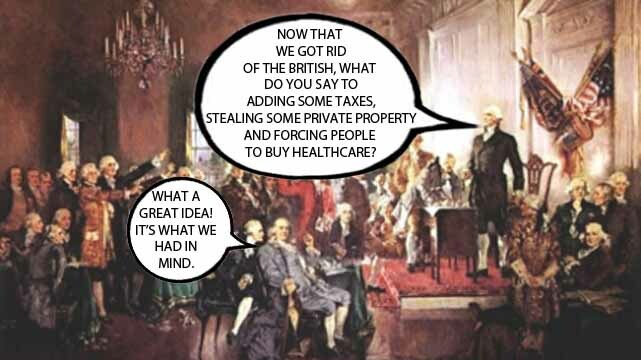 He feared if a Bill of Rights was included, it could ultimately backfire on the People. He feared that if a Bill of Rights was added to prohibit the government from intruding on rights A, B, and C, then it could be inferred that the government could intrude on rights D, E, and F. Madison explained that if you listed some individual rights, you must list them all and that would necessarily change the Constitution from forbidding the federal government from doing anything not enumerated to something that allows the government do whatever it wants as long as it is not listed in a Bill of Rights. SEC.1 That all men are by nature equally free and independent and have certain inherent rights, of which, when they enter into a state of society, they cannot, by any compact, deprive or divest their posterity; namely, the enjoyment of life and liberty, with the means of acquiring and possessing property, and pursuing and obtaining happiness and safety. SEC.3. Government is, or ought to be instituted for the common benefit, protection, and security of the people, nation, or community; of all the various modes and forms of government, that is best which is capable of producing the greatest degree of happiness and safety, and is most effectually secured against the danger of maladministration and […] when any government shall be found inadequate or contrary to these purposes, a majority of the community hath an indubitable, inalienable, and indefeasible right to reform, alter, or abolish it, in such manner as shall be judged most conducive to the public weal. The document had sixteen sections, but it’s quite clear that these short paragraphs encompassed America’s Founding Principles, which Thomas Jefferson would later incorporate into the second paragraph of the Declaration of Independence. Mason simply did not trust a government to police itself. The decision of whether to add a Bill of Rights ultimately came down to the States in their Ratifying Conventions. And George Mason, along with Patrick Henry, would do all they could to derail the ratification of the Constitution until proper assurances and restraints were added. “When the American spirit was in its youth, the language of America was different. Liberty, sir, was then the primary object. We are descended from a people whose government was founded on liberty; our glorious forefathers of Great Britain made liberty the foundation of everything. That country is become a great, mighty, and splendid nation; not because their government is strong and energetic, but, sir, because liberty is its direct end and foundation. We drew the spirit of liberty from our British ancestors; by that spirit we have triumphed over every difficulty. But now, sir, the American spirit, assisted by the ropes and chains of consolidation, is about to convert this country into a powerful and mighty empire. If you make the citizens of this country agree to become the subjects of one great consolidated empire of America, your government will not have sufficient energy to keep them together. Such a government is incompatible with the genius of republicanism. There will be no checks, no real balances, in this government. Consider our situation, sir; go to the poor man and ask him what he does. He will inform you that he enjoys the fruits of his labor, under his own fig tree, with his wife and children around him, in peace and security. Go to every other member of society; you will find the same tranquil ease and content; you will find no alarms or disturbances. Why, then, tell us of danger, to terrify us into an adoption of this new form of government? And yet who knows the dangers that this new system may produce? They are out of sight of the common people; they cannot foresee latent consequences. I dread the operation of it on the middling and lower classes of people; it is for them I fear the adoption of this system. I fear I tire the patience of the committee, but I beg to be indulged with a few more observations. At this point, the adoption of the Constitution seemed unlikely. Virginia would likely not ratify and neither would New York, and North Carolina clearly would not ratify. Without Virginia, Madison realized, there could be no hope of ever building a coalition to adopt it. Madison needed Virginia. And so he began working tirelessly for ratification. He teamed up with Alexander Hamilton and John Jay on a series of articles (collectively called “The Federalist Papers”) that were published in newspapers all throughout the States making the case for ratification. And then he changed his stance on a Bill of Rights. He promised to include a bill of rights as the first order of business for the new federal congress. This finally brought George Mason around, which then helped tip Virginia towards ratification. In the end, as we know, the Constitution was ratified by the States and we became a “more perfect Union” in 1788. On June 21, 1788, New Hampshire became the ninth and last necessary state to ratify the Constitution of the United States, thereby making it the Law of the Land. Virginia and New York ratified it within a month and North Carolina wouldn’t ratify it until over a year later (November 1789). The Federalist Papers, the debates in the various State Ratifying Conventions, and the Bill of Rights itself continue to be a lasting testament to the limited nature of the US Constitution. In past years, Tea Parties, Constitutional groups, and other conservative organizations honored Constitution Day by passing out pocket Constitutions. We have asked people to take the time to read it and become familiar with it. But perhaps the real message we need to send is how all our Founding documents fit together and why the Constitution still matters. First, let’s ask what IS a Constitution? Our Founders gave us that answer. Does it sound like our Constitution was intended to become a LIVING, BREATHING DOCUMENT? (i) The Declaration of Independence. It proclaims our philosophy of sovereignty, rights, and government. It establishes the order in our country and puts government in perspective. The individual precedes government. Government must serve the individual by protecting his rights. (ii) The US Constitution. It designed a government (checked by the sovereign powers of the States and the People) to embrace the philosophy set forth in the Declaration. We enjoy our God-given rights because our founding documents boldly assert that only We the People have the right to determine our government, since it is only by the voluntary and temporary delegation of our rights to govern ourselves that government exists. We have the right to “alter or abolish” government when it becomes destructive of its ends (which is first and foremost to protect and preserve our rights to Life, Liberty, and Property and the right to defend them). Nowhere in any of our founding documents is government given a life of its own; it has no right or power to seek its own self-interests nor to preserve, insure, or protect its existence. Yet today, government’s interests are placed above those of the People. Government has made sure that it has the exclusive power to define its own powers. Our creature has become our master. “Too often the Supreme Court uses a skewed perspective. Instead of asking: ’Are citizens’ rights being violated by this law?’ the Court asks: ‘Is the violation of citizens’ rights justified because of overriding government goals and objectives?’ Too often the answer the court delivers is ‘yes.’ When your rights get in the way of a government objective, you lose. Government created to protect your rights should have no goal higher than the protection of those rights. When government’s own goals override your rights, government is acting unconstitutionally. Government often states that these violations of citizens’ rights are necessary ‘for the good of society.’ Society is ill served by laws which violate the rights of the citizens making up that society. This is like exercising parental control. You tell your child how to act, with whom he (or she) may associate and what time he must be home. You assign household chores and responsibilities. In short, you establish rules of proper conduct. The Tea Party and Constitutional groups take a lot of criticism. The media, for example, says that the Tea Party has lost steam and has lost relevance. And sometimes, I admit it, I wonder if it might be true. But when I celebrate Constitution Day and when I continue studying the Constitution and what our Founders intended, and when I have those “light bulb” moments when I begin to understand why certain principles were incorporated into our founding documents, I am reminded of why the Tea Party was founded in the first place and why it is so important. And I am re-inspired to be a part of it, as well as the Tenth Amendment Center. It’s because the Tea Party is the party of the Constitution. We understand its relevance…… We understand why our Founders rejected that Virginia Plan in Philadelphia and why they spent four months building the consensus for a government that would be delegated only limited powers and that would be restrained by a series of checks and balances. We understand that the problems our country faces today are all a direct consequence of the federal government’s failure to keep itself limited to the express powers delegated to it by the States back in 1791 AND the States’ failure to stand up and remind the government of its limits. We understand – because we know that America is still defined by the Declaration of Independence – that every time the federal government oversteps its constitutional authority, it is taking sovereign power away from We the People and from the States. And it has to stop. We are slowly (maybe not slowly) slipping back into tyranny. There is a lot at stake in the American experiment. Ours is a nation founded on an ideal and nothing else. Whether that grand ideal will survive depends on whether the American experiment is successful or not. What is that ideal? It is the notion that individuals are sovereign and that they are endowed with Natural rights that are “self-evident” and “inalienable” which are an integral part of their very humanity. Since these rights come from our Creator, they cannot be deemed to be granted by government. Hence government is powerless to take them away or violate them. In fact, governments are instituted to serve the People and to protect those rights. It was from that ideal that our Founders understood the great challenge that would be presented: How to keep the role of government strictly limited in order that liberty is enlarged and that government is prevented from growing into a new form of tyranny. They studied history and were well-aware that the nature of any government is to control and gain more power from those it governs. And that in that challenge, we understand why the Constitution is still relevant. At one time it defined a limited government and it offered numerous protections against those governmental intrusions which they knew would come eventually. 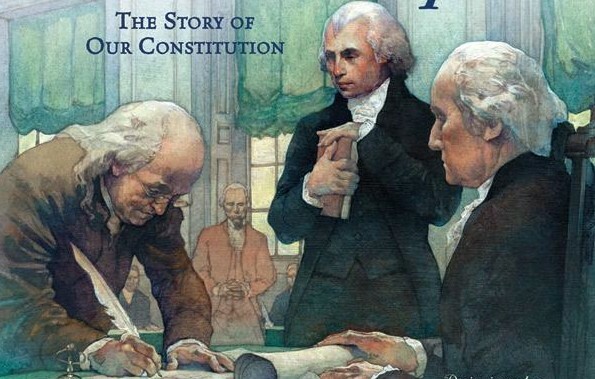 The Constitution still holds the power of limited government and still defines the proper relationship between the People, the States, and the federal government. The key is to put that document, with its original meaning and its original intent, back to work for the American people and for the protection of their inalienable rights. The Tea Party summoned the spirit of the Revolution to resurrect the Constitution. They went back to the days of peaceful civil disobedience, ownership of their rights and destiny, engagement of their government in their civil liberties, and robust discussion of what it means to be a “free” people. They took the name “Tea Party” because of its rich historical significance. The Boston Tea Party occurred on December 16, 1773 as a protest against the tax on tea imposed by a government in a far-off land that did not permit its representation in the legislative process (Parliament). Earlier that year, the British government passed the Tea Act, which authorized the British East India Company to ship tea directly to colonies while the government levied a tax of three pence on each shipment. While the Tea Act actually lowered the price of tea for colonists (so that even with the tax, the colonists were still paying less for tea), many colonists were still angry at being taxed at all. “Taxation without Representation” was a rallying cry that was particularly significant. The taxes the British tried to collect were modest and the revenue collected was to be spent entirely in the colonies for their benefit and protection. It wasn’t even going to be sent back to the mother country. So why all the fuss and cry of “tyranny”? It was because the real reason for American Revolution was the lack of political machinery to protect the colonists’ rights. In short, our founding agitators and revolutionaries weren’t as concerned about the insignificant tax on tea as they were with the underlying violations of their basic human rights. The American experiment will continue to be successful only as long as we continue to be as vigilante and protective of our rights and as long as we continue to demand that government keep its distance. And so, as we recognize Constitution Day each year on September 17, we should re-commit to our Revolutionary spirit as Americans and read our founding documents in that light. As Jefferson warned, we shouldn’t render our government one of general and unlimited power because we’ve tacitly allowed it the exclusive domain to interpret the Constitution as it sees fit. We can all know the meaning and intention of the Constitution simply by doing our homework and reading what words of wisdom our Founders left. We don’t need government officials or judges to tell us. Government wants power. People want liberty.